Hello DRU Fans! 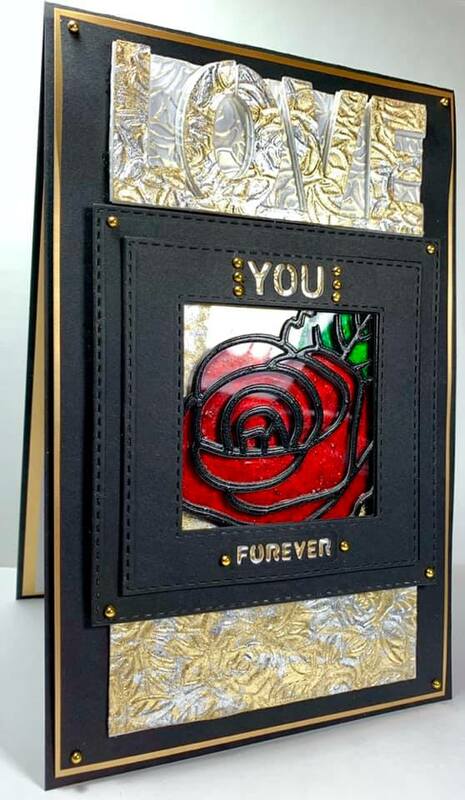 This is America, back to share a Love Card featuring a stained glass effect Rose! 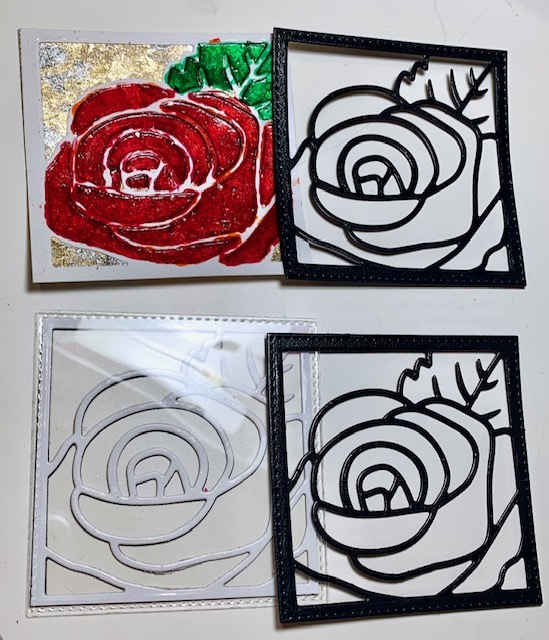 I have used 3 die-cutting sets from Sue Wilson's fab collections. 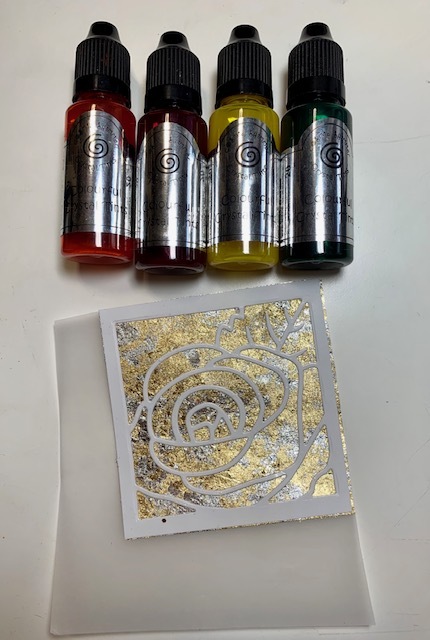 I started with die-cutting the very first layer from a golden gilded sheet I had previously prepapred, then sprayed the back of the die-cut with a strong adhesive to adhere over the gilded panel. 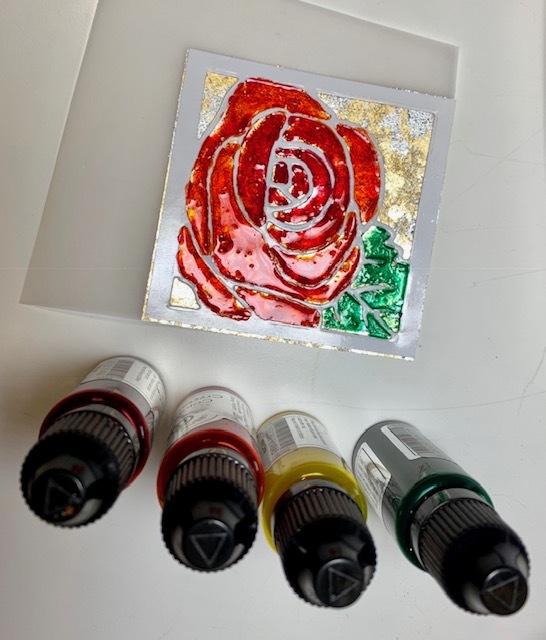 Next, I colored the Rose Die-Cut openings directly onto the Gilding Flakes using liquid crystal tints. Then repeated the color applications in-between drying times for a richer look. Wasnt worried about the color running over the lines at this point since any mistakes will be covered after the extra die-cut layers get added later. 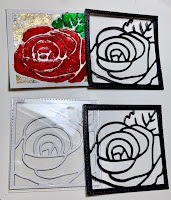 Next, I cut extra die-cut Rose Squares out of black cardstock to stack, layer and place over the colored Rose panel. This will give the flower the illusion of depth. At this point, Acetate was adhered to the back of one of the layers. 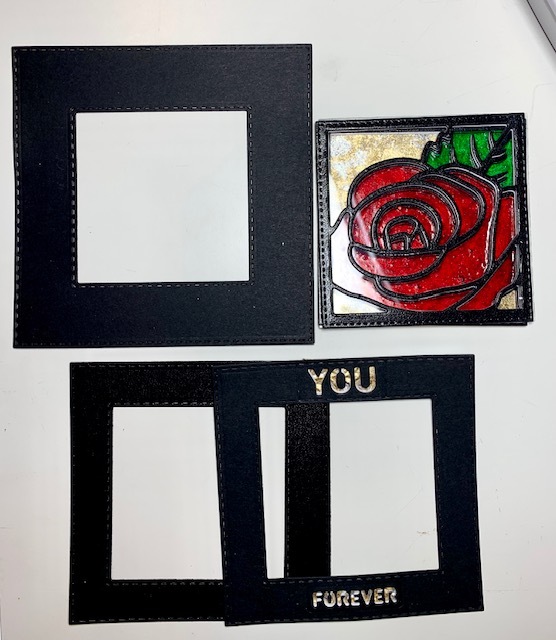 Another die-cut layer in black was added to the colored panel. 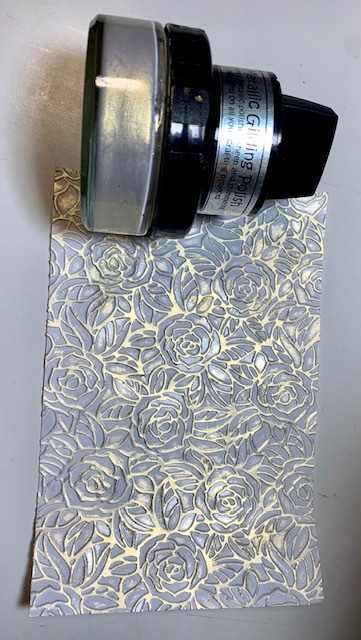 Next step, using a dry embossed sheet from a bed of roses embossing folder, I polished the raised portions of the embossing with a Golden Gilding Polish. Did this simply by rubbing the sponge gently over the raised areas. 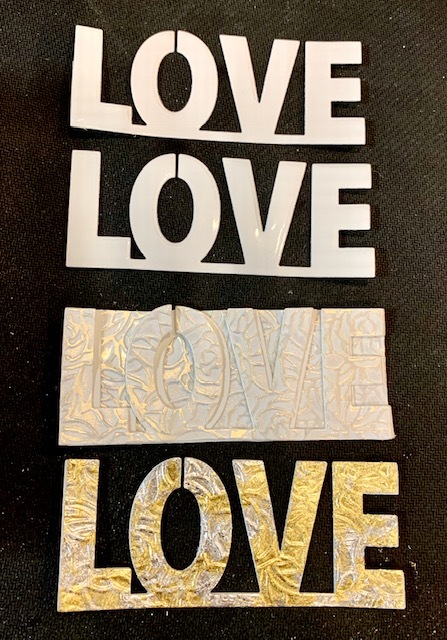 Next, I die-cut the word "LOVE" several times, (from SW's Perspectives Love Collection). And another die-cut layer from the embossed/ polished panel to place on the top of the raised word. A closer look below shows the fab texture and polished shine. 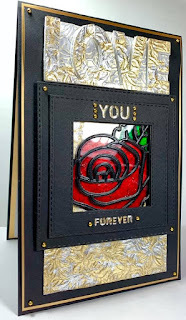 Next I adhered the stacked Rose panel to my cardfront base then topped this with a black die-cut frame. 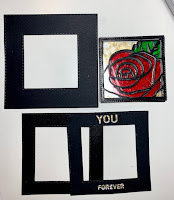 The mini word openings "You" and "Forever" were die-cut directly directly onto this frame and backed the word's openings with leftover pieces from the same embossed/polished sheet. This helps to carry the look throughout the design. Gold flatback gems are the final finishing touches. Apologies as the sparkling gold and reflection from the scetate arent showing well in these photos. That's it! Hope you give these fun Cutting Dies a try! 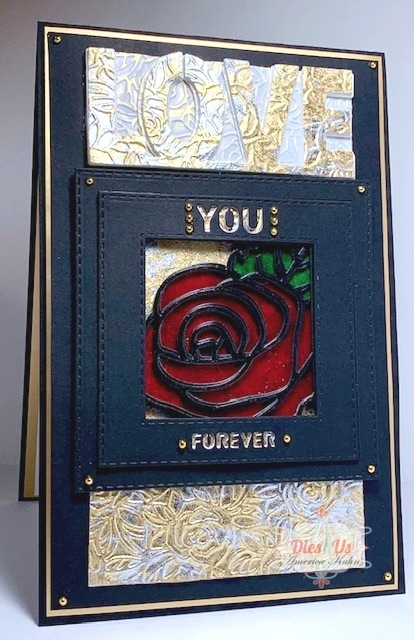 For more inspiration, please stop by the Dies R Us Challenge Blog. 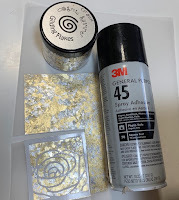 There's a new challenge theme offered on the 1st and 15th of each month and one lucky randomly drawn winner will receive a gift voucher prize to the Dies R Us Store. For your convenience, all the important Dies R Us links are provided below. Wow, wow, wow! 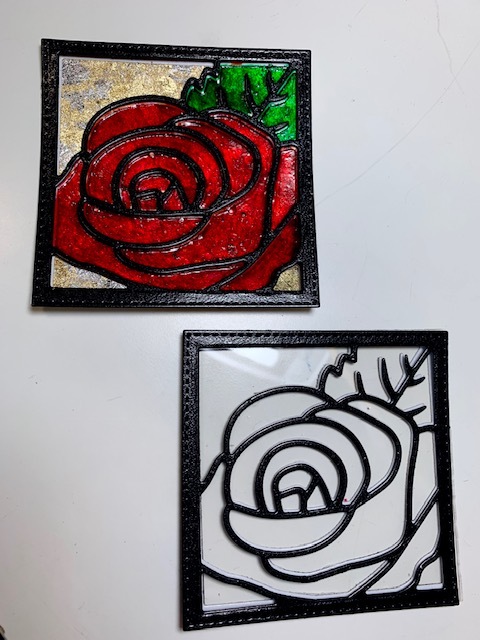 Love that stained glass effect! Oh my! 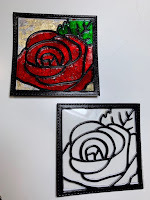 Love the stained glass effect! I love all the layers here, America! Oh my! This is just fabulous! Gorgeous! 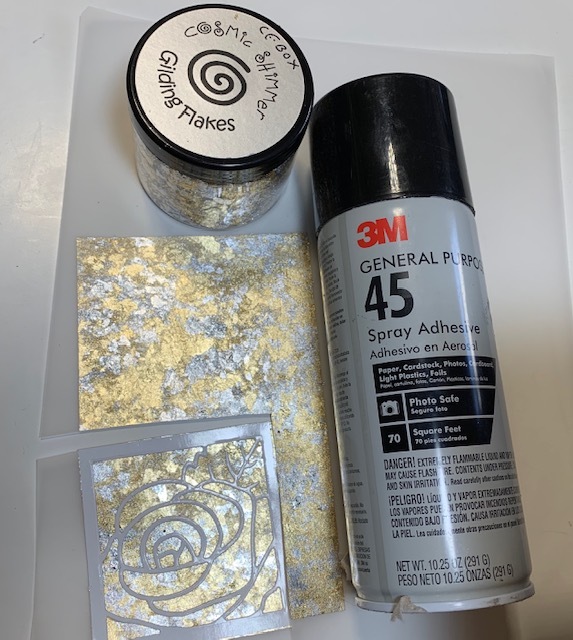 I've never used gilding flakes. Will have to give it a try!